In retrospect, it’s almost too much to believe. 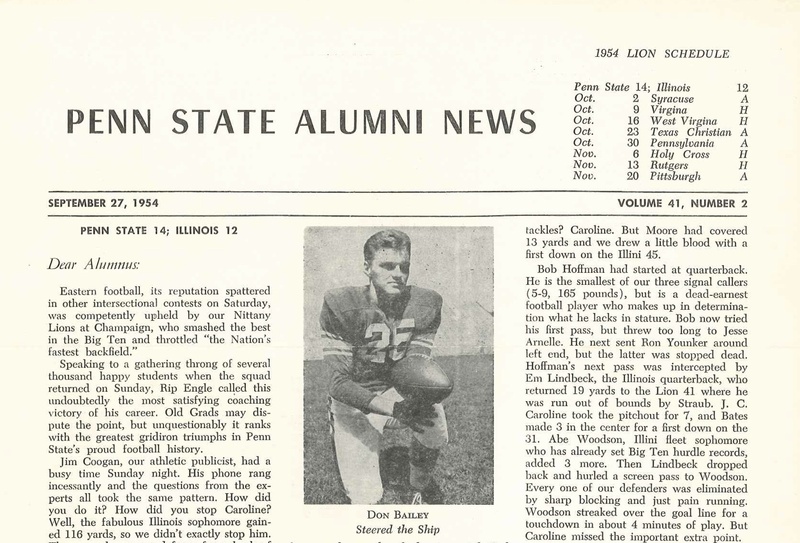 The Illini suffered through a miserable 1-8 season in ’54, while Penn State rolled to a solid 7-2 mark. So why the excitement over a narrow win against an awful team? Because, at the time, it looked like the Lions had done something pretty impressive. That Illinois team was coming off a 7-1-1 mark in ’53, when they finished in the top 10 and won a share of the Big Ten title. The league was loaded, and with a stud backfield led by JC Caroline (who ran for more than 1,200 yards as a sophomore in ’53, breaking the Big Ten record held by Illini legend Red Grange), Illinois appeared the most loaded of them all. Caroline, who would go on to a 10-year NFL career with the Chicago Bears, ran for 116 yards on that September afternoon, but the Illini couldn’t manage much else. The Lions countered with Lenny Moore ’56, not a bad running back in his own right, who finished with 137 yards on the day. Rosey Grier ’56 led Penn State’s defensive efforts to minimize the damage up front, and quarterback Don Bailey ’56 (pictured) ran for 76 yards, tossed a touchdown pass to Jesse Arnelle ’55, ’62g and added some well-placed punts. With this year’s squad still smarting from that historic loss in Columbus last week, it’s probably also worth mentioning a Penn State-Illinois matchup from the not-so-distant pass. In late October, 2002, the Nittany Lions dropped a heartbreaking 13-7 decision to a Buckeye team that would go on to finish unbeaten and win the national championship. A week later, the Lions were home to face… Illinois. Penn State won that one, 18-7. This entry was posted in From the Archives and tagged Don Bailey, Illinois, JC Caroline, Jesse Arnelle, John Black, Mickey Bates, Ohio State, Red Grange, Ridge Riley, Rip Engle, Rosey Grier. Bookmark the permalink.